What do you think about when you think about electronic music genres? Probably the standard house, dubstep, trance, techno, right? Well, what about their subgenres? You’ve probably heard of progressive house, chillstep, psychedelic trance and minimal techno. Those terms are thrown around pretty casually among listeners. Let’s go a step further: ever heard of complextro? Brostep? Nitzhonot? How about tecno brega, or nortek? Emerging from the ashes of industrial music, ambient industrial employs elements of noise and shock, weaving them together with subtle, easily-digestible harmonies. The overall effect is catchy and smooth, with a definite (albeit light) overlay of grunge in the mix. Notable artists in the genre are Controlled Bleeding, Akira Yamaoka, Der Blutharsch and Zoviet France. Ever heard of any of them? Neither did we, but it’s definitely worth a look. Commonly misunderstood as any form of jazz played by musicians on LSD, Acid Jazz is actually a division of Downtempo music. Originating in the London club scene of the mid-1980s, acid jazz fuses elements of jazz, soul, funk and disco, and ties them together with smooth downtempo drums. A Tribe Called Quest were the most notable pioneers of the genre, bringing it to new American ears in the early 90’s. A mutation of hardstyle/hard trance using sounds normally found in techno music, aggro tech provides a convenient midpoint between head banging and head bobbing. It commonly includes upbeat, energetic beats, very synth-y synth lines and, of course, satanic lyrics. The overall effect is dark, but not too dark for a dark night club. Way too dark for a happy night club, though. Artists of note in the genre are Conbichrist, DYM, Suicide Commando and Tactical Sekt. Sweet, sweet nostalgia. That’s what nintendocore is based on, though that’s certainly not the only thing the genre has going for it. Nintendocore fuses the more abrasive aspects of modern rock music with chiptune and video game sounds, with obvious influences coming from punk and heavy metal music. The result is strange, sweet and certainly dynamic. Notable contributors are Minibosses, Math the Band, Horse the Band, and Crystal Castles. No, it’s not industrial music that causes death, as we have listened to the genre in researching this article and lived to write about it. 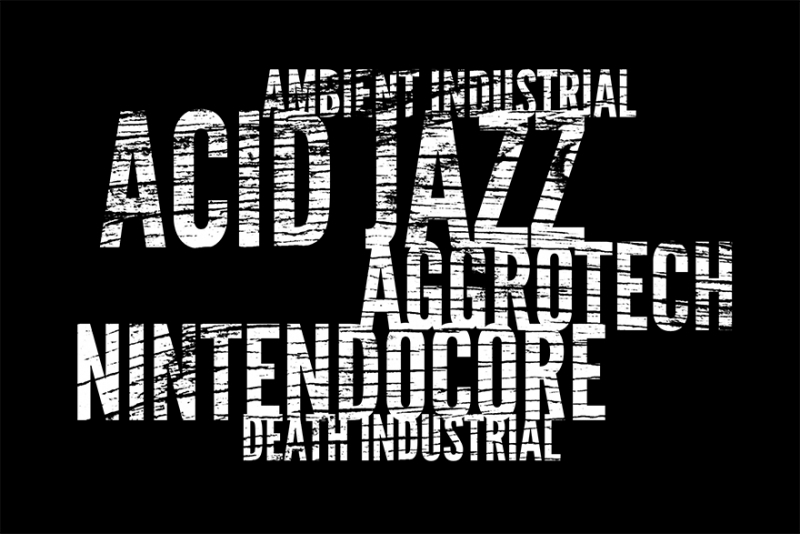 A subgenre of power electronics (which is itself a subgenera of industrial music), death industrial is categorized by its abrasive loops, low-frequency drones and, of course, its distorted or screamed vocals. Renowned death industrialists are Author & Punisher, Anenzephalia, Genocide Organ and Hieronymus Bosch.